This lesson is a continuation from the Exponent Laws - Part 1 lesson. The next three laws that you are going to learn can be derived from the first three laws shown in Part 1. So, the ideas behind next three laws are not completely new. Again, it is important for you to understand these laws before using them. This helps to minimize mistakes. Now, watch the following math video to learn the next three laws. This lesson is a continuation from part 1 of the Exponent Laws. To emphasize, it is very important to understand the logic behind these laws before you use them. The laws that you are going to learn can be derived from the first three laws in part 1. So, they are not completely new. Let's start, consider this term, bracket 2 multiply by 3 , to the power of 4. Now, we can break this term into four parts of bracket 2 multiply by 3. We can see that 2 multiply by 2, multiply by 2, multiply by 2, gives 2 power of 4. Now, notice this, this term bracket 2 multiply by 3 to the power of 4 is equals to, 2 to the power of 4 multiply by 3 to the power of 4. With this observation, we can now formulate an exponent law. Let's first replace these numbers with alphabetical letters. This gives bracket 'a' multiply by 'b' to the power of n.
By referring to this, we can also see this term, bracket 'a' multiply by 'b' to the power of N is equals to, 'a' to the power of 'n' multiply by 'b' to the power of n.
So, we have another law of exponent. 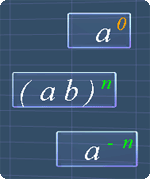 Bracket 'a' multiply 'b' to the power of 'n' is equals to, 'a' to the power of 'n' multiply b' to the power of 'n'. Let's take a look at the next law of exponent. For us to understand this law, let's consider dividing 2 to the power of 3 with 2 to the power of 3. Now, using the second exponent law, we can see that, this term is equals to, 2 to the power of 3 minus 3. Three minus by three is 0. So, now we have 2 to the power of 0. Alright, let's calculate this term using another way. We can see that 2 to the power of 3 divides by 2 to the power of 3 is equals to, 8 divides by 8. Now, 8 divides by 8 gives 1. From here, we can see something interesting. Since all these terms are equal to each other, we can say that, 2 to the power of zero is equals to 1. Let's first replace this number, '2' with 'a'. This gives 'a' to the power of zero. By referring to this, we can deduce that, 'a' to the power of zero is equal to 1. So, here we have another law of exponents. 'a' to the power of zero equals to 1. Let's take a look at the next law of exponent. For us to understand this law, let's consider this term, 1 divides by 2 to the power of 3. Now, notice the number 1, at the numerator. Using this exponent law, 'a' to the power of zero equals to 1, we can rewrite 1 as, 2 to the power of 0. Now, using the second law of exponents, 2 to the power of 0 divides by two to the power of 3 is equals to, 2 to the power of 0 minus 3. 0 minus 3 gives negative 3. So now we have, 2 to the power of negative 3. Again, we can see something interesting. If we observe carefully, since all these terms are equal, we can see that 2 to the power of negative 3 is equals to 1 divides by 2 to the power of 3. Let's rewrite these two terms here. Let's first replace these numbers with alphabetical letters. This gives 'a' to the power of negative 'n'. By referring to this, we can deduce that, 'a' to the power of negative 'n' is equals to, 1 divides by 'a' to the power of 'n'. Finally, we have another law of exponents. 'a' to the power of negative 'n' equals 1 divides 'a' to the power of 'n'. That is all for this lesson. The next lesson will show you some examples on using what you have learn in this lesson. You can start by going through the series of questions on exponent laws - Part 2 or pick your choice of question below.